Pokhara is hot– I mean temperature. After weeks of hiking at high altitudes waiting for the guest house proprietor to start the dung fire in the small wood stove in the center of the common room, I find myself in a place where shorts and t-shirts are all that’s required. Having trouble with that adjustment. I read the menu at breakfast and discovered that in addition to eggs and hash browns, I could also order “creeps” — banana, honey, lots of other options. Then spent more time handling practical stuff with impractical web pages. Handle is not the right term. Attempted unsuccessfully is closer. Oh to be where success is measured by meters of elevation gained or KM walked than a silly check mark from a ridiculous web site. I had lunch near the north curve of lake near the paragliders touchdown point at the “Taal rest-o-bar.” Paragons of honesty they handed me a menu, then an addendum saying that today they had no gas to cook with, so they could prepare the following items over a wood fire. I was refreshed by the simplicity and they grilled up some amazing chicken wings. It’s really cool to see how everyone works within often unanticipated constraints here. Can imagine the melt-down a Buckhead clientele would have given the obstacles that occur here on a regular basis. Spent a good bit of the day working on an essay, the rest wandering. My favorite discovery goes back to yesterday when I saw two men finishing out some dense wood boards (looked like mahogany). 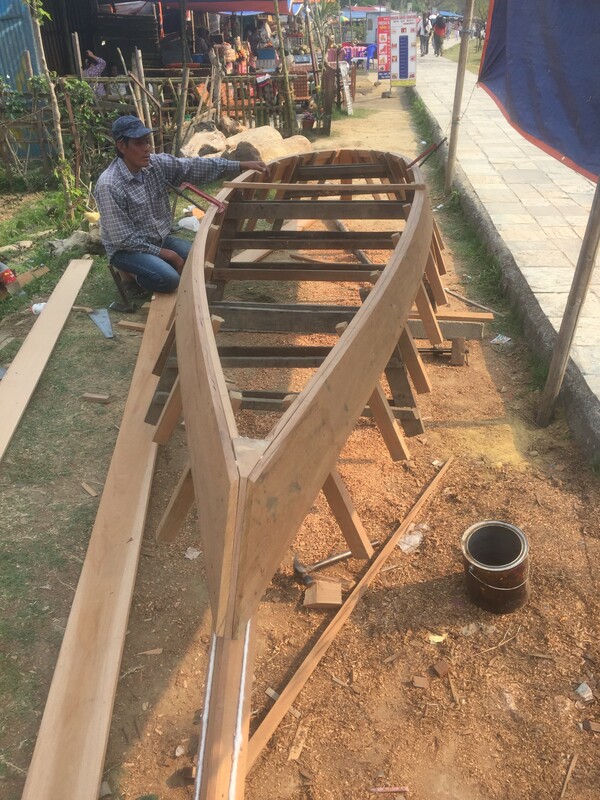 Today, I passed them as they were framing out the boat they were building (in the style of the many dory-skiffs that populate the waterside). Clearly skilled builders, they had it all laid out including the oakum-like cording at strategic watertight points. Dusk fell over another hazy day, and I indulged myself with a Duvel before dinner and a fairly early night in– trying for the most boring person alive here I guess.